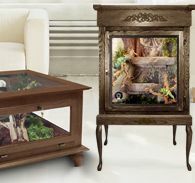 Our Majestic custom reptile cages offer more viewing area than ANY OTHER furniture-style reptile enclosure system on the market. All our Majestic custom reptile cages & reptile enclosures are made with a solid Oak exterior frame (hard Maple wood and Cherry wood, and other custom woods available), and fully lined with an aluminum frame which protects them from moisture on the inside! Our modular furniture-style reptile cage system allows you to get any size enclosure into your car or truck, through your doorway, around corners and up up stairways! It also allows for easy storage or shipping if you are not using your cage. You will not find wood reptile cages with this level of versatility anywhere else! Give your pet room to stretch! 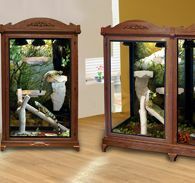 These enormous custom Majestic custom reptile cages & enclosures are our most popular Majestic Reptile Cage Specials! 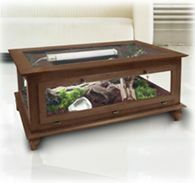 With a solid oak frame and fully lined aluminum interior, Plenty of room for multiple bearded dragons, lizards, or snakes in many of our reptile enclosures. Optional Pull Out Dividers separate a reptile cage to house multiple species, or add a hood for lighting or a stand for storage of all your herp supplies. 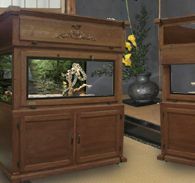 The Majestic wood reptile cages & enclosures below come in Autumn Cherry Stain on Oak Wood, Black Paint on Maple Wood, Natural Oak Stain on Oak Wood, Dark Walnut Stain on Oak Wood, Natural Oak Stain on Oak Wood, White Paint on Maple Wood. 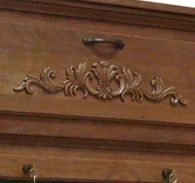 Our head carpenter alone has over 25 years experience building hands-on one-of-a-kind custom furniture pieces. Custom Cages is the #1 producer in the USA of build to order bird, reptile and small animal enclosures building each unit one at a time according to the customers' specific needs. All of our wood, aluminum and stainless steel materials are made in the USA and all or our Majestic Reptile Enclosures are hand crafted one at a time at our Neenah, Wisconsin facility. We pay special attention to detail with every piece, hand sanding every unit and fully assembling to ensure a perfect fit of all components for every reptile enclosure before they leave our door. 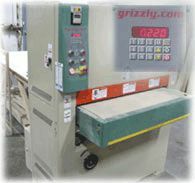 All Majestic Enclosures are constructed in our own state-of-the-art woodworking facility, complete with digital readout equipment accurate to thousandths of an inch. These enclosures are not made in a part-time hobbyist's basement or garage but in a full-service facility with all there is to offer in technology to create strong joints, great finishes, and superior cratsmanship. This also allows us to create the high-quality pieces with far less lead time than the competition. 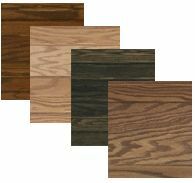 We use only the best wood and other materials in our Majestic reptile enclosures. 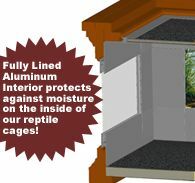 Each reptile cage comes standard with a solid oak frame, is fully lined with an anodized aluminum interior (not powder coated steel), comes STANDARD with crimp lock stainless steel wire (not welded or powder coated), and is made with materials bought from many suppliers close to our facility in northern Wisconsin. To learn more about our available materials, please visit our Material Info page. 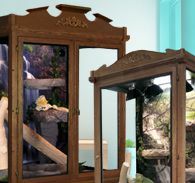 Each reptile cage comes standard with your choice of one of our four colors of water based stains (safe for pets) or can have a custom stain applied to match your decor. Then, they receive 2 coats of a water based clear coat. Between each coat of stain and clear coat, the enclosures are hand sanded to give a high quality, classy sheen second to none. Once you run your hands across our finished pieces, you will gain a feeling of quality and confidence your birdcage is fully protected from the elements. 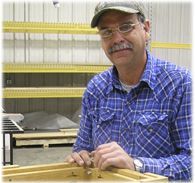 Our carpenters and engineers have decades of experience building custom reptile enclosures. We are fully confident that we can customize to your specific needs no matter how custom the project. The above enclosure was a custom piece made to match our customer's decor. Whether it be matching a color, a custom size, or a re-engineered design, we can meet our customers needs and at the same time not sacrifice on quality and turn it around quickly. All our Majestic reptile cages are fully lined with an anodized (not powder coated) aluminum interior, making them moisture resistant on the inside! On average it takes about half an hour to put one of our Majestic reptile enclosures together making it easy to disassemble to fit in a car or truck, fit through doorways or to go up stairs. Our sectional cages screw together in partitions, allowing you to put up or take down part of your cage to fit your needs at any given time. One of the most frustrating aspects of purchasing an enclosure is trying to decide how large to get it. With our reptile cages, you can purchase the size that is appropriate now and if your herp collection grows you can modify the size of your Majestic cage later without wasting your original purchase. Simply add another section to your enclosure and you have the new size you now need! Add a hood to any of our reptile cages - an excellent way to add vibrant light to your cage without having to look at unsightly fixtures. Decorative hoods, like the one shown above, give a finished look to a wood lizard cage, or snake cage, making it a centerpiece in your home. Stands are a great place to keep herp supplies such as food, treats, and also elevate the cages to eye level. Feet and legs are available for all Majestic reptile cage sizes. Some large sizes may require additional feet at an extra charge. Legs are not available for some larger size cages. Please call us at 1-800-941-2243 for details. Custom legs are available upon request. Casters are not available for feet or legs. Finish your Majestic reptile enclosure with our beautiful decorative crown molding accents for the top of your cage! Great for hiding lights and adding to the look of your enclosure. These images are even more stunning in person than in our pictures. Images are printed, laminated to the back of your cage, and covered with a durable, protective clear material for moisture, scratch and UV resistance (prevents fading). Images are extremely high resolution and will be cropped to fit the back of your cage perfectly. 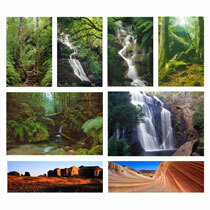 Over 40 backgrounds to choose from, or have your own custom image printed for your Majestic bird enclosure. You just bought a big cage with lots of space, why not use it? Our line of ReplicaTM Furniture is molded from natural objects with high density expanded polyurethane making them look very realists, resitant to harboring bacteria and insects, and are easy to disinfect! We also designed these products to be strong enough to hold extremely large animals, yet much lighter than natural objects. They make the perfect solution for most habitats. 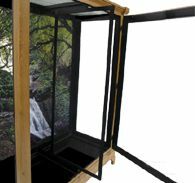 Our removable dividers can be added to any Majestic reptile enclosure. The dividers easily remove from the front of the cage and you can use as many as you wish to divide your enclosure.